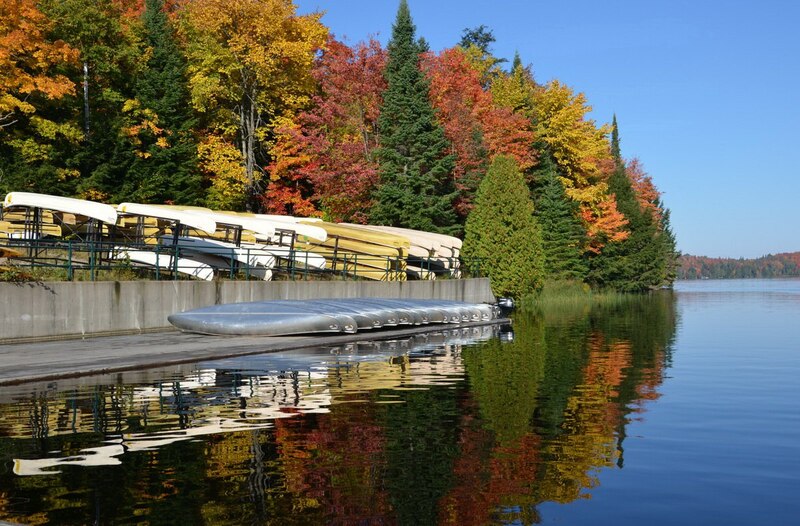 Come join me on a virtual tour of the magnificent Fall Colours In Algonquin Park this past autumn. 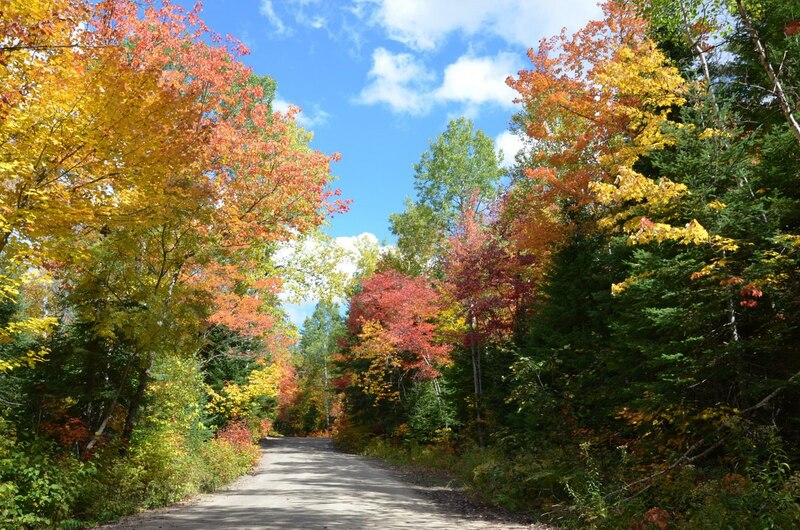 Even before we entered the Park, the show of coloured foliage took our breath away. 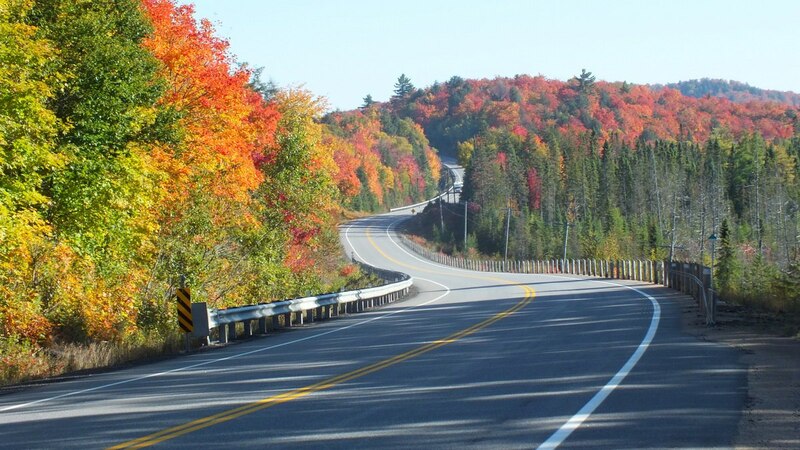 At the boundary of the Park is Park Lake, known to many as Long Lake, and as we passed that way, stretching before us was this tantalizing stretch of highway lined with trees dressed for the season. Our photos were taken over the course of three days at all hours of the day. Proof positive that the best is not always in front of you was this view of splendid colour first seen in my rearview mirror. As so many others were doing, we made a prompt stop on the shoulder of the road to capture the beauty. One morning saw us escaping off the main highway onto Arowhon Road in the hopes that we might come across a Grouse. Either Spruce Grouse or Ruffed Grouse would do, but none were found wandering the narrow dirt road as they so often do. 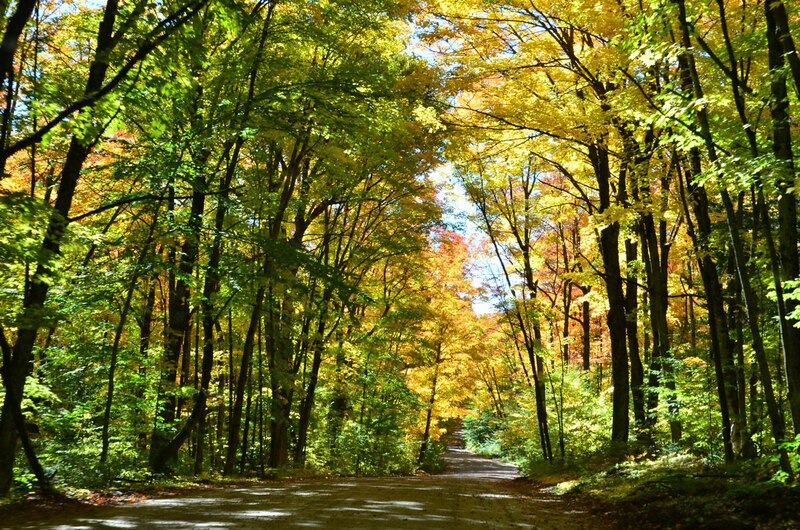 The drive through the woods was magical with dappled shade from the arched canopy of sunlit leaves transforming the drive into a journey into the unknown. It was only my second time traveling this road that leads to Arowhon Lodge, and the previous time had been as the deep shadows of night threw the forest into darkness. It was all new to me. For late September, the day was gloriously warm and beautiful, and the air was alive with the rich, earthy smells of the forest. 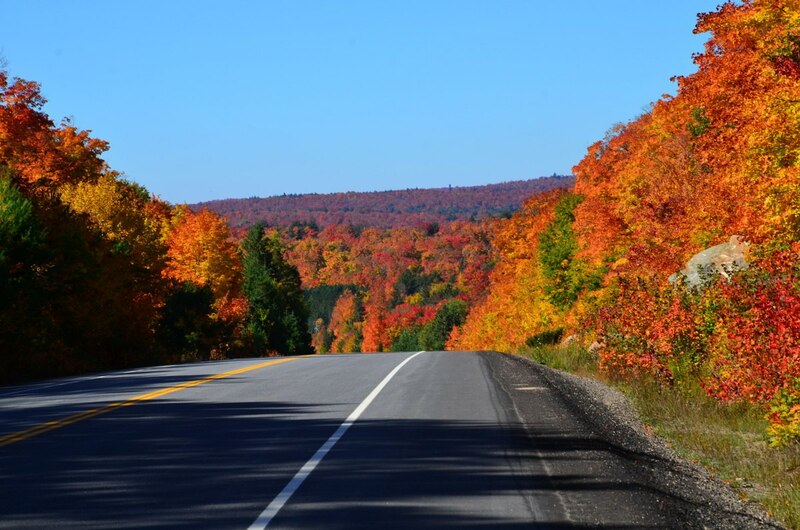 Around each corner, trees blazing with gold and crimson had us stopping for photographs. We wondered if we would ever get to the Lodge but didn’t really care how long it took. The pleasure was in the scenery along the way. We were in awe of the wonders created by Mother Nature. 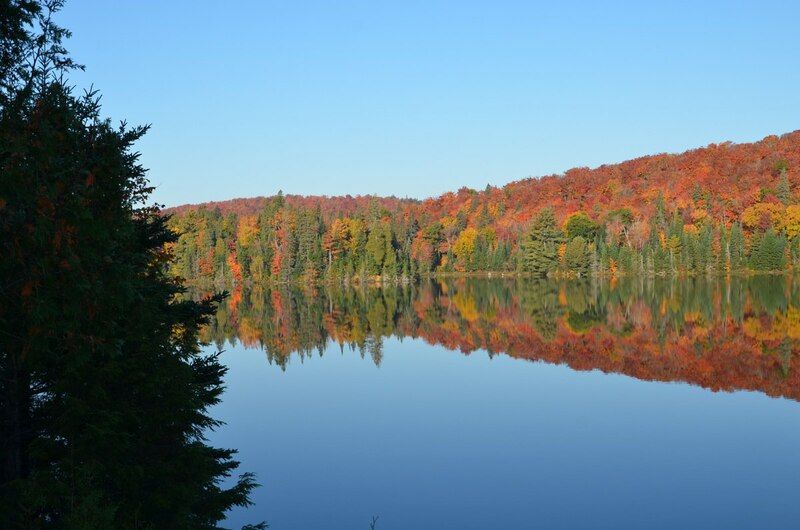 At the end of the road, we found lovely reflections of the fall splendour in the placid surface of Little Joe Lake. 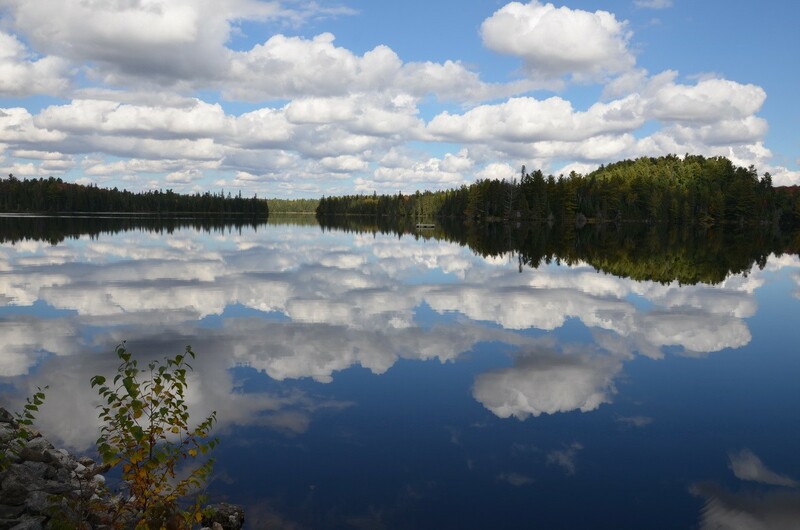 Not only did the Fall Colors In Algonquin Park impress me, but I was struck by the perfection of clouds mirrored in the still water. The whole image gave me a dreamlike feeling. Bob and I braved an early morning hour the next day because we were dead set on finding a bull moose and had plans to hike to Wolf Howl Pond, a location where moose often spend time at dawn and at dusk. 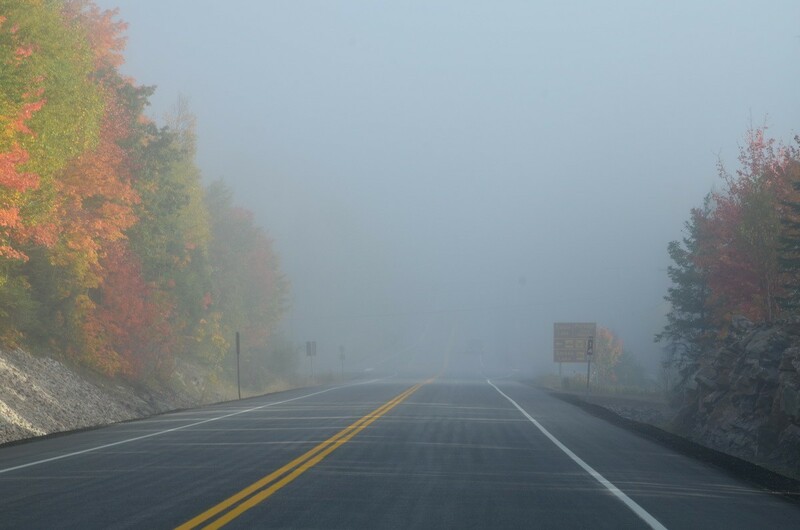 Our progress was delayed somewhat by the impenetrable fog that shrouded the highway in the vicinity of Smoke Lake. 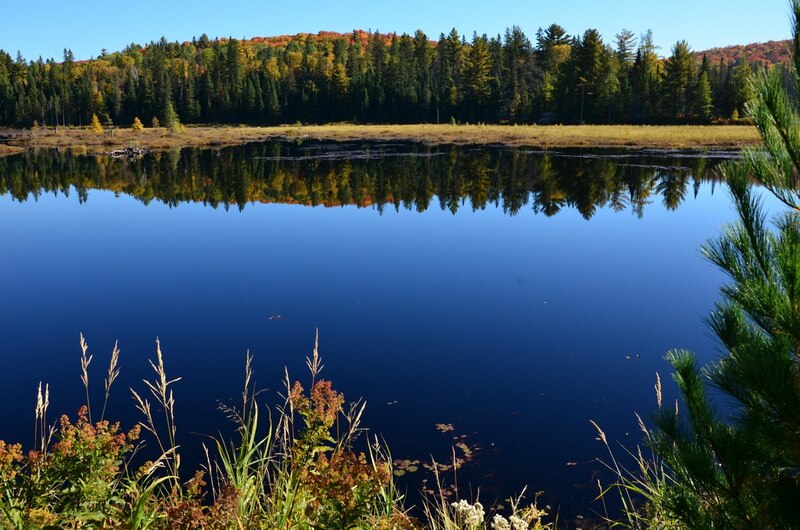 The silence at Wolf Howl Pond was deafening…not a soul to be seen, nor any moose for that matter…but as the veil of fog lifted, it revealed Nature’s smiling face reflected perfectly in the tranquil shallow pond. With the darkness of the water and the impossibly deep blue of the vast September sky, the whole of it reminded me of an artist’s fanciful painting. 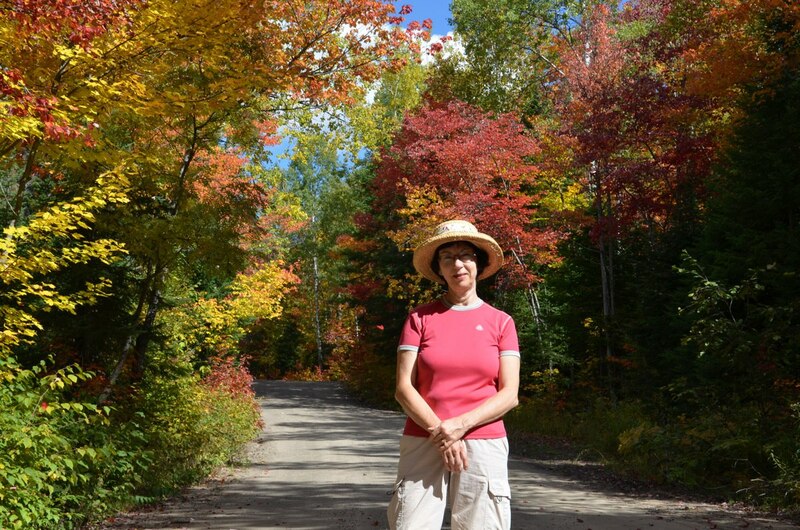 Spectacular fall foliage was not hard to find. 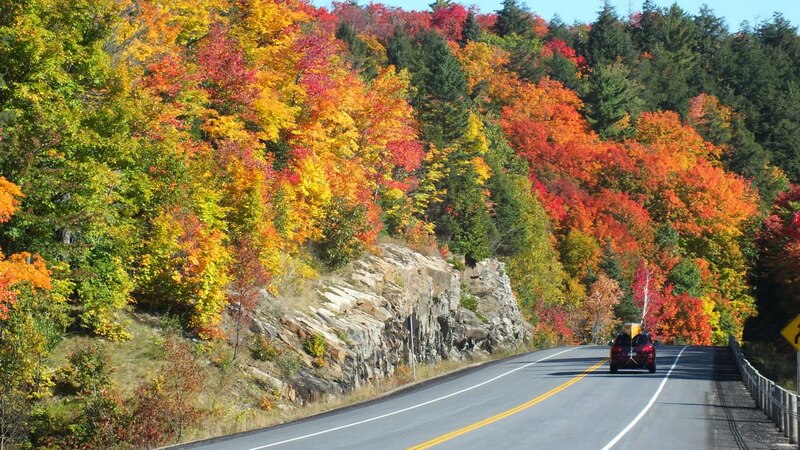 All along the highway corridor, colourful vistas rose up to greet us as our car descended one hill or climbed another. It is hard to imagine that the trees can put on such a show even as they are winding down in preparation for the cold winter months ahead. In my humble opinion, showy autumn leaves rival the flamboyance of flowers in any garden at the peak of summer only on a much grander scale. 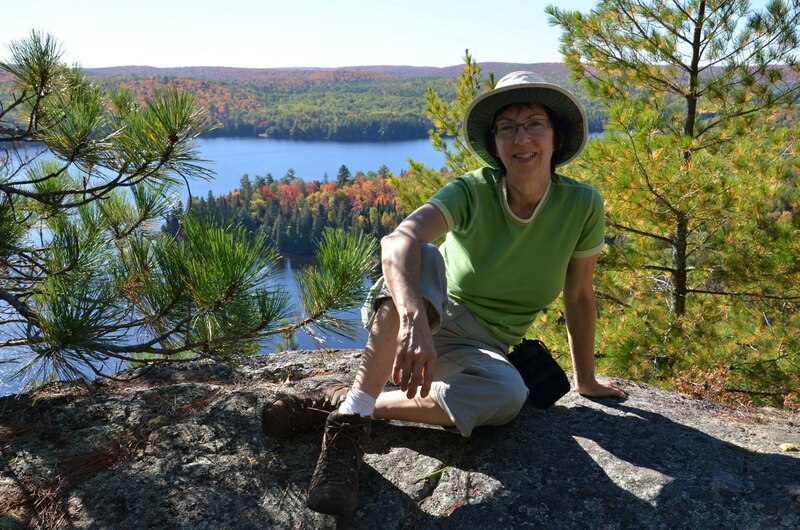 That same afternoon, Bob and I hiked in on the very popular Lookout Trail to achieve a fantastic view of the distant hills and lakes. 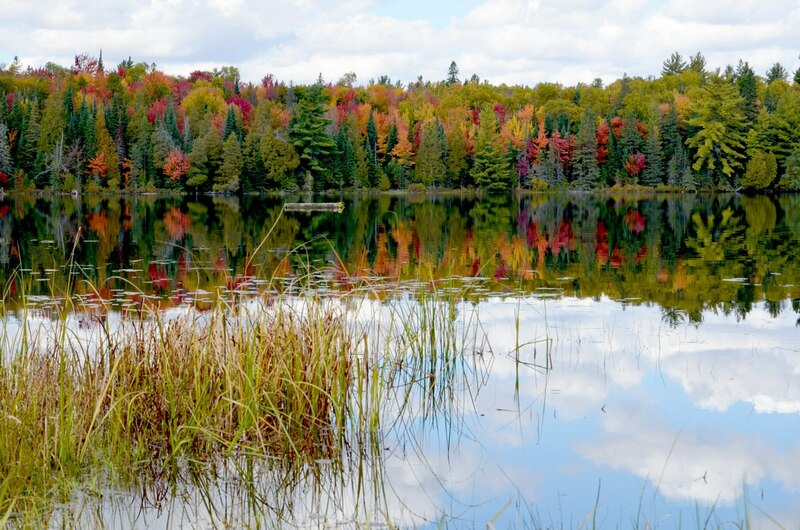 The Fall Colors In Algonquin Park with their blazing reds transformed the maple hills into an endless, seamless quilt stitched carefully with yellows and greens. 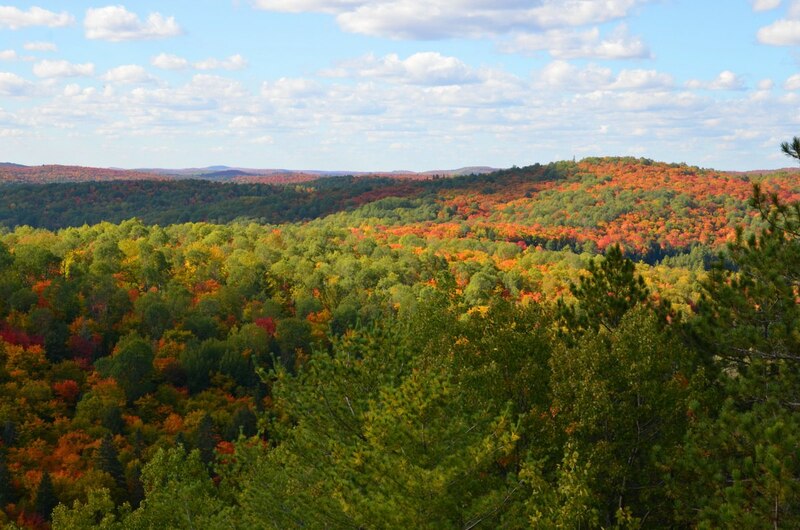 The Lookout Trail is a mere 1.9-kilometre loop (1.2 miles) but is fairly steep and rugged. 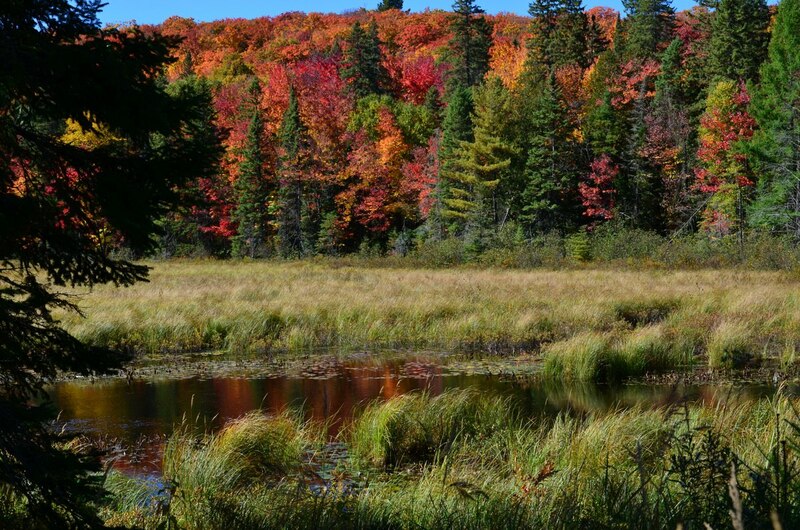 We were glad for the use of our walking sticks and were rewarded with an all encompassing view of several hundred square kilometres of Algonquin’s vast forested area. 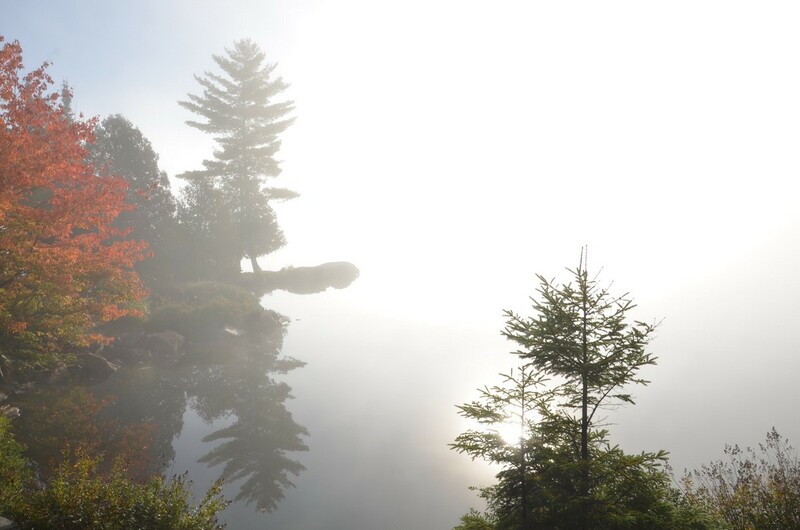 The subsequent morning, we were brought up short by the ethereal beauty of Smoke Lake. Ensconced in such a thick fog that made the lake almost invisible, it definitely embodied its name. Even as we dallied on the rocks in the mist, the morning sun worked its magic and slowly burned off the haze revealing trees liberally hung with leaves painted red and yellow. As the curtain was drawn, the stage was set for a perfect day of canoeing or fishing while sightseers reveled in the beauty. Further into the Park, Bob and I hiked in to see the century-old pines on Big Pines Trail before venturing to climb the muddy, rocky ridge on Centennial Ridges Trail for another perspective on the landscape. 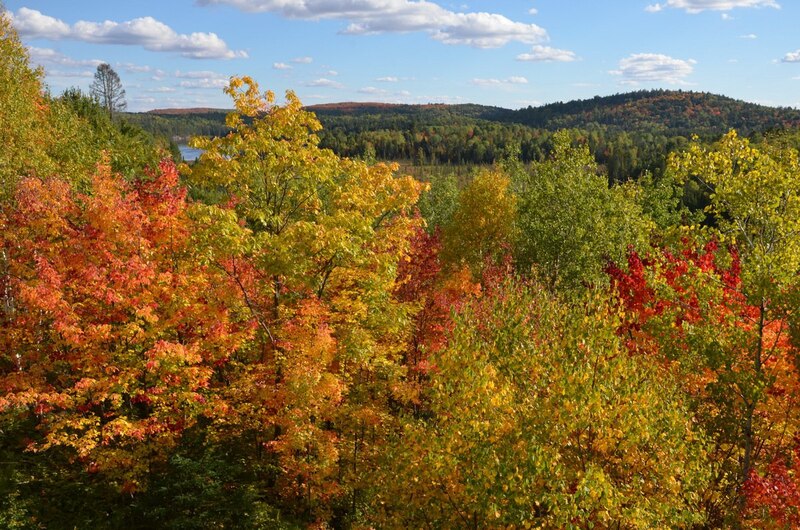 Algonquin Provincial Park had reported that the sugar maple canopy was at its peak, but the birch and aspen were also contributing brilliant yellows to the overall kaleidoscope making for a spectacular view of Whitefish Lake. The trail is a 10-kilometre (6 mi) loop meant to be done in a clockwise direction, but a boisterous group led by Park’s staff had gone left at the trailhead, so we opted to go right and climb to the ridge normally visited last on the trail. The sparkling water of Whitefish Lake was embraced by an array of colourful trees populating an island, a peninsula and the shore far below the lookout. 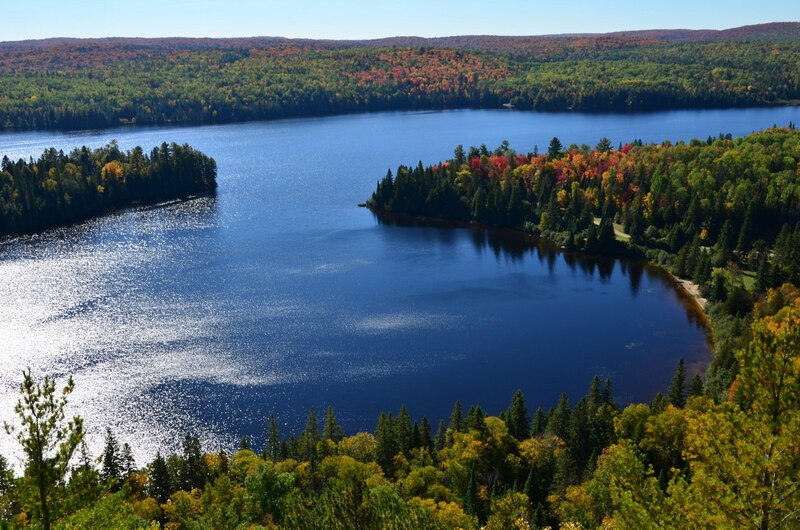 It is from cliff-top vantages like this that the true essence of Algonquin Park with its vast interior of forested hills, rocky ridges and countless lakes can be appreciated. The hike is strenuous, and we have completed the whole loop in the past, on a hot 90F-degree day many years ago, but on this trip, we stopped here to sit back, relax and enjoy the view before returning to the parking lot. 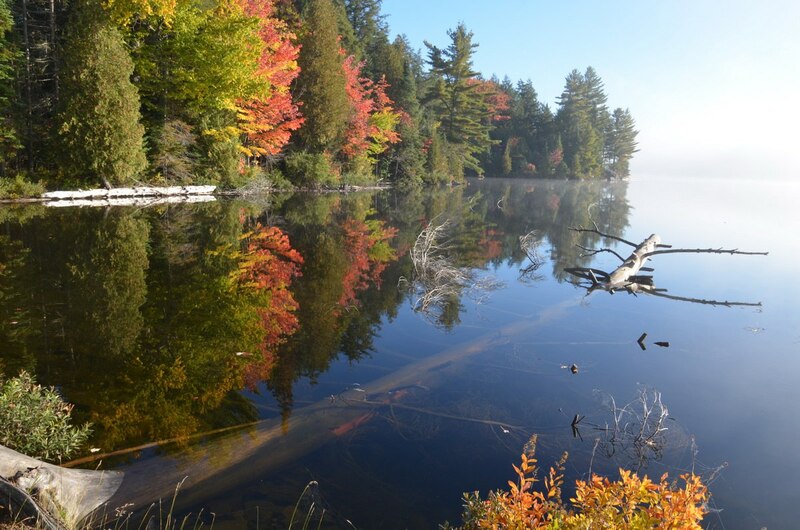 The day of our departure, Bob and I planned to rent a canoe and explore Canoe Lake. We were in no particular hurry. As we poked along the corridor, there was still time to savour the sublime autumn colours. From our perch at roadside, it was hard to tell where the shoreline of Tea Lake ended and the water began. Hundreds of trees growing impenetrably thick, and billions of multi-coloured leaves dramatically lit by the rising sun and reflected so beautifully in the tranquil water were blazing with orange, gold and crimson. In both directions, the forest glowed like a red hot ember, and the lake was helpless to squelch the intensity. The parking lot of the Portage Store was abuzz with activity when we pulled in, but still, we were the third customer to line up for a rental that day, and by 9:30 a.m., our paddles were dipping and pulling the water. 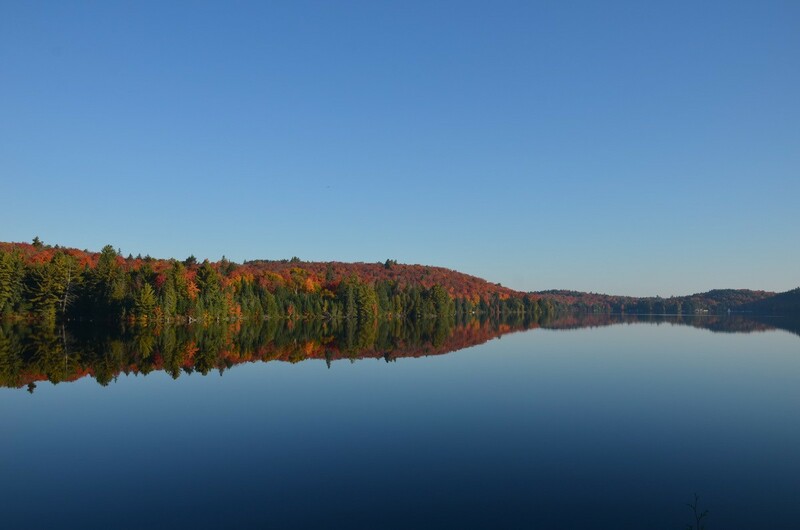 Bob and I were thrilled to be experiencing the same sights once revered by Tom Thomson, one of Canada’s greatest landscape artists. We discovered Canoe Lake to be much smaller than expected, so over the course of several hours, we paddled from one end to the other and checked out some of Tom’s haunts. 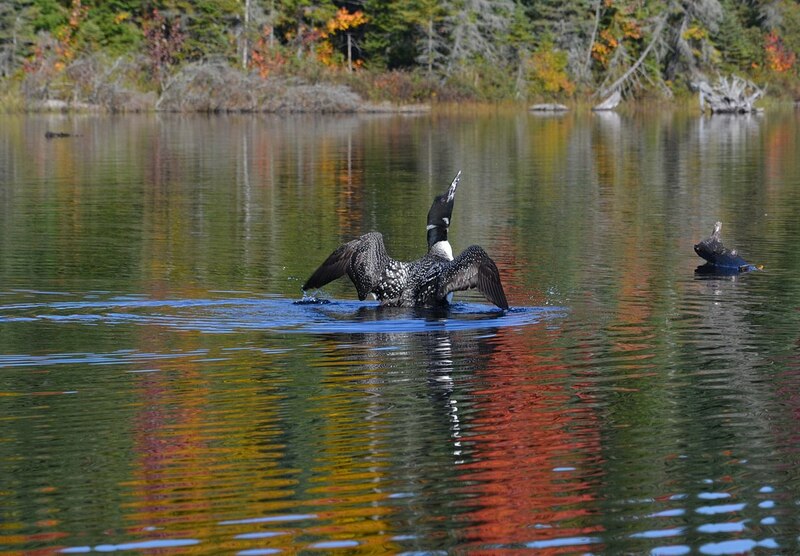 Thanks to our quiet mode of transportation, a Common Loon was unaware of our approach. For a long time, Bob and I circled the general area where both this adult and a juvenile kept disappearing below the surface only to reappear a short distance away. I loved that they were in constant communication with one another with the parent making restrained calls whenever the young one was out of sight. 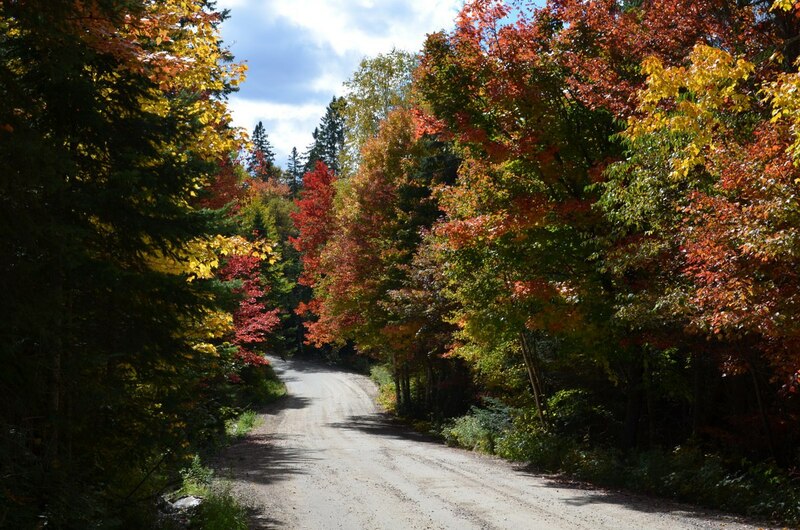 It is such a wonderful experience to take in the changing colours every fall. One must time it right to catch them at their peak, but for those people who have never witnessed the transformation before, it is truly miraculous. I cannot imagine living in a land that does not undergo the distinction of four separate seasons, one so dramatically different from the other. To see emerald evergreens amidst blinding splashes of garnet and gold creates a mystic pattern that is larger than life.